Menopeace is a comprehensive formula that is designed to help women undergoing through menopause. It eases night sweats, hot flashes, joint pain and other symptoms caused by menopause during the transition in a woman’s life. The menopause supplement contains isoflavones that are derived from Soy and Red Clover which are the richest plant sources of the natural derivative. There are other additional herbs in the blend which support hormonal health. The blend of natural ingredients helps offset declining hormonal levels in the female body. Who is the Manufacturer of Menopeace? Menopeace is manufactured by Natural Wellbeing Distribution Inc. which was founded in 2001 with the aim to bring natural healing using the power of herbs. To fulfill their vision, the company sources its ingredients from all over the world, choosing natural herbs that have been proven by time and science to aid in health and wellbeing. The company also integrates technology into their professional developed herbal formulas to improve their efficiency. Going by, the brand has an active customer care service with an open line that customers can call with any questions. They promise to call back if one leaves a message outside business hours. Natural Wellbeing also has a website where one can gather information on a product or reach out to the company for assistance. 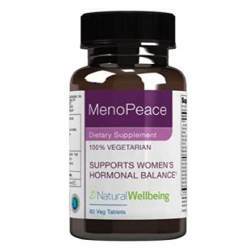 Menopeace is a blend of vitamins, minerals and herbs that provide a balance for the female hormones resulting in better health and wellness. In the west, many women use hormone therapy treatment to treat menopause and peri-menopause. The treatment is associated with side effects like migraines and the development of breast tumors, and may sometimes by combined with synthetic progesterone which poses serious health concerns. Menopeace contains natural derivatives that simply mimic female hormones without serious health implications. Along with natural herbs, the supplement also contains vitamins and minerals that promote good health and wellness. Menopeace Ingredients – Are they Safe & Effective? Menopeace contains a wide range of ingredients that can be found on the back side of the product’s packaging. Among them is the proprietary blend of isoflavones from soy, dong quai extract, chaste tree extract, red clover extract, black cohosh and gamma oryzanol. Isoflavones from Soy – The derivatives from the Soy plant have been associated with some female hormone-like activity in the body. Red Clover Extract – Red Clover extract contains 4 different isoflavones (genistein, daidzein, biochanin, and formononetin) and may have more activity than the isoflavones from soy. Gamma Oryzanol – The extract occurs naturally in rice bran oil and may be beneficial in hormone balance, controlling cholesterol levels, and digestive function. Black Cohosh – The herb is rich in calcium, potassium, magnesium, and iron and may beneficial in maintaining a healthy female hormone balance. Dong Quai – A member of the parsley family, dong quai is an important part of Chinese medicine. The plant is believed to have many benefits for female health. Other ingredients include: Eleuthero, Riboflavin, Vitex (Chaste Tree), Thiamin, Vitamin E, Niacin, Vitamin B6, Folic Acid, Calcium, Magnesium, Boron and Selenium. What are the Advantages of Menopeace? The supplement contains natural ingredients that may reduce the frequency and severity of hot flashes, night sweats and other symptoms of menopause. The product may also help with mood improvement and better sleep for more restful nights and active days. Menopeace may also regulate hormones and help with normalizing the menstrual cycle for less painful cramps. The supplement may also be useful for women who suffer from cysts in the breasts during menopause. What are the Disadvantages of Menopeace? The product contains soy which may cause allergies to some people. Soy allergies are quite common so check the full list of ingredients before consumption. Being plant extracts and natural supplements, one needs to give them time to work. This means that they may take a longer time to show any results. The website states that one should expect results between 4 to 8 weeks. The product contains black cohosh which is linked to liver toxicity. While the product costs more than other similar supplements, some women experience no changes at all even after taking the product for over two months. How Should You Take Menopeace? It is advised to take two capsules of Menopeace with a meal. How Much Does Menopeace Cost? 1 Bottle containing 60 vegetarian tablets (1-month supply) costs $24.99 for one-time delivery while it costs $22.49 for a member. What Is Menopeace Return Policy? The company has a solid 90-money back guarantee in case one is unhappy with a purchase. The company will refund the full purchase price of the product (less shipping fees). A single product can only be returned once per person, per household to prevent fraudulent claims. The company requires that the product be accompanied by a Return Authorization Number which is obtained from their customer care agents. Does Menopeace Offer a Free Trial? The company does not offer a free trial. Menopeace promises restful days and happier life by giving you a peace of mind during the menopause and the menstrual cycle. The supplement purports to have active ingredients that help with balancing female hormones thus alleviating the symptoms of menopause like night sweats and hot flashes. It may also help regulate the menstrual cycle, reduce breast cysts during periods and less painful cramps. However, Menopeace is not suitable for people who have allergic to soy. The supplement may also take a long time to show any results. Further it contains black cohosh which is associated with liver toxicity. There are many similar formulations in the market and you may choose another if Menopeace does not work for you. Fortunately, natural therapies for menopausal symptoms such as weight gain, hot flashes, night sweats, decreased libido, and mood swings are available. Since many women experience weight gain during menopause, many natural menopause supplements contain herbs and botanicals that support a healthy metabolism. Menopause supplements should be evaluated on proven ingredients, ability to reduce hot flashes and night sweats, ability to provide hormonal balance and boost libido and its overall value. Below you’ll find some of the most effective menopause supplements on the market today, in our opinion. Read about The Top Rated Menopause Supplements of the Year 2019.